Yesterday the Flyers unveiled the long-awaited 50th Anniversary jersey. My initial reaction was pleasant surprise. Yes, it features a lot of gold (gasp!). But the gold stands out nicely against the cool white surrounded by the familiar Flyers orange. My first thought was creamsicle….in a good way. The jersey looks new, fresh, and different. Not just another boring variation of the same jersey over and over again. But apparently I am in the minority. Based on the overwhelming reaction of Flyers fans on social media, the new jersey is a big dislike. Apparently, people are very unhappy about the gold. And they keep making references to the hated Penguins, as if the Penguins own the color. Never mind the fact that, at least according to my eyes, it is a totally different tone of gold. One fan on Twitter photo shopped the new jersey, changing the gold to orange. I thought it looked only a little different than the gold, and a 100% more boring. But apparently some fans are more comfortable sticking to orange and black. In my mind, this jersey unveiling at the One Liberty Observation Deck (great location for such an event) signaled the cutting of the ribbon on the 2016-17 Flyers season, which celebrates the team’s 50th Anniversary. (Symbolized by the color gold.) The season is upon us. It’s World Cup, training camp, pre-season, then bam…the regular season starts. So I was thrilled to see Flyers hockey news front and center yesterday. And I will be putting one of those jerseys on my back my next visit to Wells Fargo Center. The plans work. Flyers GM Ron Hextall has a plan to be patient and grow the organization from within. In a similar way, rookie coach Dave Hakstol has a plan for how to guide a winning hockey team. And this season proved that both plans are working well. The Flyers had a very successful 2015 draft, taking several highly-touted prospects in early rounds, including number seven pick, defenseman Ivan Provorov, who is regarded as one of the top NHL prospects. The Flyers’ farm system is stacked with many other promising prospects who could make a huge impact on the Flyers within the next few years. When many people thought that Hextall would take the conservative route and hire a seasoned NHL coach at the beginning of this past season, Hextall went outside the box and hired University of North Dakota coach Dave Hakstol. I am sure there were people who did not think Hakstol could make the leap from college to the NHL. And though it took a little while for the Flyers to adjust to Hakstol’s system, they did and have thrived in it. I think that the team gelling together in Hakstol’s system was a main reason for the Flyers’ successful season-end push to the playoffs. I see this positive trend only getting stronger as next season gets underway. This team has tons of heart and perseverance. Innately talented, smooth-skating teams are a dime a dozen. I’ll take an underdog with heart and a no quit attitude every time. And that is what we saw from these Flyers in every minute of play versus the Caps during the playoffs. The Caps were bigger, faster, and more talented, but they almost didn’t win the series. (And, it’s tough to lose when it seems like even the officials are on your side.) But personal feelings about the horribly uneven officiating aside, the Flyers never gave up, even after going down 0-3 in the series. 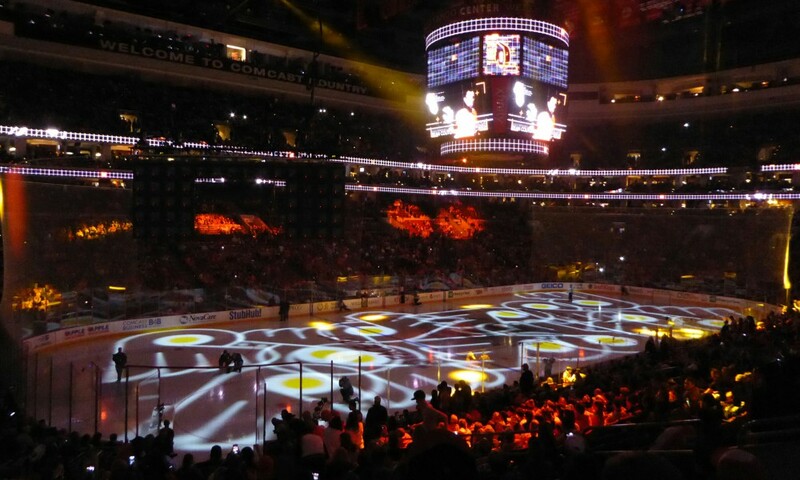 I was at the first playoff game in Philly and it was not a pretty sight. No one would have blamed the Flyers for giving up after that one. But they didn’t. They never gave up and were within a goal of pushing the series to a decisive Game 7. And, in every penalty kill, impossible save, and struggle for a quality shot on goal, the Flyers stayed in the game by sticking together and never giving up. That is a team that any fan will be proud to cheer for when hockey season starts again. The future looks bright. Thanks to Hextall’s focus on building this team from within, the Flyers are already looking like an incredibly promising team over the next few seasons as the stable of elite draft picks start making their way to Philly. The names go on and on (Konecny, Provorov, Sanheim, Morin, Stolarz, Hagg) and it is feasible that all of them could make a huge impact on the Flyers soon. Add them to the solid core that already exists and the sky’s the limit. And Hextall has proven that he is capable of making nearly impossible deals to clear cap and roster space to make room for the rookies when they are ready. Is it October yet? The 2016-17 season can’t get here soon enough. The scenario is a familiar one to Flyers fans. The Flyers have a one-goal lead with the final seconds of the game clicking by, then, bam!, the other team scores and here we are in overtime. Another hard-fought regulation victory lost at the last possible moment. But that is exactly what happened Friday evening when the Flyers gave up a goal to the Predators’ Mike Fisher with only 20 seconds left in the game, leaded to a 2-2 tie at the end of regulation. At that moment I was so frustrated that the Flyers had been unable to hold the lead, that I forgot that they actually had a chance to win the game in OT. It was too easy to think that a team that had just given up a lead at the end of regulation was not going to fare well in OT. And, we know how things go for the Flyers if OT progresses to a shootout. All I could think about was what the Flyers were lacking: focus, determination, leadership, mental toughness. And I have never been so happy to have been so wrong. With 52 seconds left in OT, the Predators were called for a too many men on the ice penalty, giving the Flyers a 4-on-3 advantage. Before setting up for the powerplay, the Flyers called a timeout. Coach Dave Hakstol handed the whiteboard to captain Claude Giroux and he drew up what would become the game-winning play – a slap shot by rookie defenseman Shayne Gostisbehere assisted by Giroux and Voracek. In a flash, a regulation disappointment turned into an OT victory. But I think this win meant much more than that. Perhaps I am wrong, but I imagine that most NHL head coaches draw up their team’s plays most of the time. So Hakstol handing that duty to Giroux at such a critical time spoke volumes. I think he was saying: “I may be the coach, but you are the captain. You are out there on the ice with your teammates and you are their peer and leader. I trust you to make the best decision in this situation.” Maybe I am reading too much into this, but this move and outcome had to do wonders to the Flyers’ team psyche and confidence. As the team has struggled this season, there have been questions about team leadership, the coach’s new system, and the team’s desire to win. I think that this timeout and resulting win answers some of those questions. Namely, Giroux is the team’s leader, they do listen to him and respect him (as does their new coach), and their new coach is willing to entrust the game to his players – the sign of a good coach. Time will tell what this moment in the Flyers 2015-16 season meant, but so far it looks good. Yesterday, the Flyers went into the always tough Madison Square Garden and defeated the New York Rangers 3-0. A turning point in that game was reportedly Flyers defenseman Luke Schenn coming to the defense of teammate Nick Schultz when Schultz was injured on a hit. Though he was hit with a penalty for fighting, Schenn’s teammates praised him for turning around the momentum of the game. Another boost to the team psyche and self-confidence, which seem to be getting stronger by the day. Maybe it will be proven that giving Giroux the whiteboard during OT of that Black Friday game against the Predators was one of the smartest things Hakstol did all year. #PlayBoldly! That is the Flyers slogan for the season. Too bad the Flyers’ marketing department didn’t check with the players before plastering this phrase all over souvenir cups and the like. Let’s take a look at a season that started with a good effort versus Tampa. That’s about where the season ended. Since that opening night in Florida, the Flyers traveled to Miami, where they ran on the beach before the game and then didn’t #PlayBoldly versus the Panthers. They’ve also managed losses against New Jersey, who was projected to be as bad as the Flyers. The Flyers then lost to Buffalo at home and lost to Buffalo in Buffalo. They gave up 49 shots while putting up only 22 in Edmonton. They lost to Calgary, who had been 1-5 in their building before the Flyers came to town. The Flyers also carried a four-plus goals against for that stretch. #PlayBoldly. And let’s look at the goals scored on that trip. Buffalo: 1, Vancouver: 1, Edmonton: 2, Calgary: 1. And the picture looks even more bleak tonight after a shutout loss to Colorado and another team meeting. And the pride problems run deep in this organization. The newly-promoted president, Paul Holmgren, started the problem when he was general manager. He signed several big-dollar, long-term contracts with veterans that didn’t pan out. And it will take new GM Ron Hextall several more years to dig out from under the impossible salary cap situation that Holmgren left him. Yet Holmgren still collects a paycheck from the organization. After the loss in Calgary, the team strives to remain positive. Michael Raffl was quoted as saying “if we play like we played last night, we’re going to win a lot of games.” But here’s the problem, did I mention that the Flames only beat one team in six tries before the Flyers came to town? And that they gave up an ungoldly 4+ goals a game at home? So, it’s great to be positive, but Raffl, your squad just lost to a team that is BAD. You’re not going to win games when you can’t win a game against a team that hadn’t won at home. Follow that with Dave Hakstol’s quote: “We earned a point.” Well, I know that you’re coming over from college, but the game in the NHL is to win. A point isn’t helpful when it’s against a team that gave away 10 before you came into town. It’s a loss. It is what it is. And all of this brings me to the subject of leadership. Where is Giroux? Where is Voracek? Didn’t they both recently sign big contracts? I seem to recall comments from the captain such as “we’re hungry after reflecting on last season.” Really? #PlayBoldy? Really? There seems to be a lack of pride amongst the team. Raffl’s quote could be taken as being good with losing. Team meetings mean nothing if they don’t translate into change. Too many men on the ice penalties. Twice in a game? Three times in two games? Where is the focus? Where is the pride? Where is the leadership? Where is Hextall (who is actually trying to fix the mess)? At the very least, the Flyers should be competitive. And the team should figure out how to play 60 minutes every game, not just the games against winning teams. The fans are paying big bucks to fill the Wells Fargo Center seats and are devoting time to the team only to watch losses to bad teams. Sloppy play. No defense. No offense. Pride? Where is it? #PlayBoldly? Really? When does that start? Since the day Ron Hextall became General Manager of the Philadelphia Flyers, he has preached his philosophy of building the team from within by drafting and nurturing young talent. Hextall has kept that promise with a fruitful 2015 draft and a vow to not rush the Flyers growing stable of young prospects. This fan has been on board with Hextall’s plan from day one, and I believe that developing young talent is the only way for the Flyers to “right this ship” and become a Stanley Cup contender again. What I didn’t realize until this week was how difficult it would be for fans to be patient with the implementation of Hextall’s plan when face-to-face with that that young talent in action. Let’s start with 18-year-old forward Travis Konecny. In his brief time in the Flyers camp this preseason, he was on fire, showing impressive speed and tenacity. I did not see him play in a preseason game, but I saw a clip of him speeding down the ice and making a big hit. His skating was so fast that for a minute I thought the clip was on fast forward. He impressed Flyers management, but was sent to his junior team earlier this week to gain more experience. When I heard the news my reaction was: I get it but I don’t like it. I knew he probably wouldn’t make the Flyers’ opening night roster, but I was hoping he would stick around camp for a while longer. The second case in point, and perhaps the most difficult one for Flyers fan to swallow, is the case of 22-year-old defenseman Shayne Gostisbehere. I saw him score a goal Saturday night in the Flyers’ preseason game against the Islanders, his third goal in three games. He had a lot of ice time, making it obvious that the Flyers’ brass were giving him every opportunity to prove himself, which it seemed he did. But then came the news that he had been sent to the AHL Lehigh Valley Phantoms. Based on the social media reaction, most fans seem to get it, but some are confused and disappointed about this decision. Of course the real answer as to why Ghost (and perhaps several other highly-touted prospects) are no longer in the Flyers camp is not so much because of Hextall’s plan as it is because there is no place for them on the Flyers roster even if Hextall wanted them there. Unfortunately for Hextall, he inherited a handful of under-producing veterans with expensive, lengthy contacts that are going to take a while to get rid of (one way or another). Until then, the talented kids will gain experience in the juniors and minors while us fans wish we could fast forward to a few Octobers from now. But if we patiently wait, I believe that Hextall will prove that his plan worked, and today’s prospects will become tomorrow’s Cup-contending Flyers. Flyers Captain Claude Giroux returned from the IIHF World Championships in Prague last week with a gold medal and no doubt a major feeling of accomplishment, especially after inexplicably being left off of Team Canada for the 2014 Winter Olympics. Here are three reasons why playing in the World Championships made Giroux a better Flyer for the upcoming NHL season. Confidence. The past few NHL seasons, Giroux has gotten off to a slow start and ensuing dip in self confidence. Gathering 10 points in 10 games in the World Championships in May leads to a confident Giroux entering Flyers training camp in a few months ready to start the season in mid-season form. Experience. Playing in Prague added valuable experience to Giroux’s already stellar resume. His World Championship teammates and opponents were some of the best in the world, and one cannot discount the benefit of being exposed to other coaches, arenas, etc. After all, learning is a lifelong experience. Accolades. Giroux’s performance at the World Championships was very strong, and it earned him and Team Canada international accolades following their decisive gold medal victory over Russia. Accolades become part of a player’s resume and reputation and build a player’s confidence and experience. Flyers owner Ed Snider was recently asked how he feels about the Flyers core group of players heading into the upcoming season. The first thing he mentioned was the success of Giroux and several other Flyers at the World Championships. He knows that playing in Prague made Giroux a better Flyer.